Paddy Power 14 Up is similar to their 2 Up offer which is one of the most popular bookmaker offers among matched bettors due to the potentially high returns for little risk. The main difference between 14 Up and 2 Up is that 14 Up is eligible on NFL games whereas 2 Up is for selected football matches. If you'd like to learn more about 2 Up, you can do so in our 2 Up matched betting guide. what is the paddy power 14 up offer? If you're familiar with Paddy's 2 Up offer, you probably won't need to read this explanation but put simply, if you place a bet on any televised NFL game and the team you backed goes 14 points ahead at any point in the game, Paddy Power will pay your bet out as a winner at that point whether they go on to win or lose. The strategy to potentially profiting from 14 Up is simple but you may have to be available to place bets or cash out during games and so it is important to make sure that you are not placing bets on games which are running while you are asleep, which may be the case depending on where in the world you are. Be aware that some NFL games can run for hours despite there only being four 15 minute quarters. This is due to the clock being stopped when the ball goes out of play. To qualify for 14up, you simply need to place a bet on the moneyline market which is for either team to win. You'll notice that the moneyline market odds can sometimes be quite low compared to a football match. This is generally because there is no option to bet on the draw as it is very unlikely to happen. Before placing a bet on a team to win, you will want to find a close match. This is when the back odds on Paddy Power are very close to the lay odds for the same team on a betting exchange. The key to profiting from 14 up is to keep your qualifying losses to a minimum and so finding a close match is essential. Once you have found a close match, simply place your back bet with Paddy Power and lay your bet on a betting exchange such as Betfair Exchange or Smarkets. When you back and lay your bet, you'll probably make a small qualifying loss. The profit comes from when/if your team goes 14 points up at any point during the game. If they do, then you have a couple of options. Depending on the odds after your team has gone 14 points ahead, you may wish to cash out your lay bet. If the cash out amount is greater than your qualifying loss then you will have made a profit! If the other team closes the 14-point gap or goes ahead, the cash out amount on your lay bet will increase, sometimes dramatically! You can choose any point during the game to cashout so do so when you are happy with the profit which you will make. If you don't cash out your bet and you let your lay bet run, you will either lose your lay bet which would mean you'll be down by the amount of your qualifying loss, or, your lay bet will win meaning that you will have won both your back bet and lay bet which should return a very nice profit! We have found a good match on the game above and we now need to back and lay our bet. We place a £100 bet with Paddy Power on Green Bay Packers and will use a matched betting calculator to determine our lay stakes. This is a standard back and lay bet and so we will use 'normal' or 'stake returned' on the calculator. We can see from the image above that if we placed a £100 back bet with the given odds, we would need to place a £100 lay stake which has a liability of £117. Our qualifying loss for this bet will be £2 whether the Green Bay Packers win or lose. We can only make a profit should they go 14 points ahead at any point during the game. Green Bay Packers go 14 points up! If our team goes 14 points ahead, Paddy Power will pay our bet out as a winner within 15 minutes, although, it's usually within a couple of minutes. Now that we have been paid out as a winner, whatever we cash out on the exchange from our lay bet will be our profit (minus the £2 qualifying loss). You have 2 options when cashing out your lay bet. 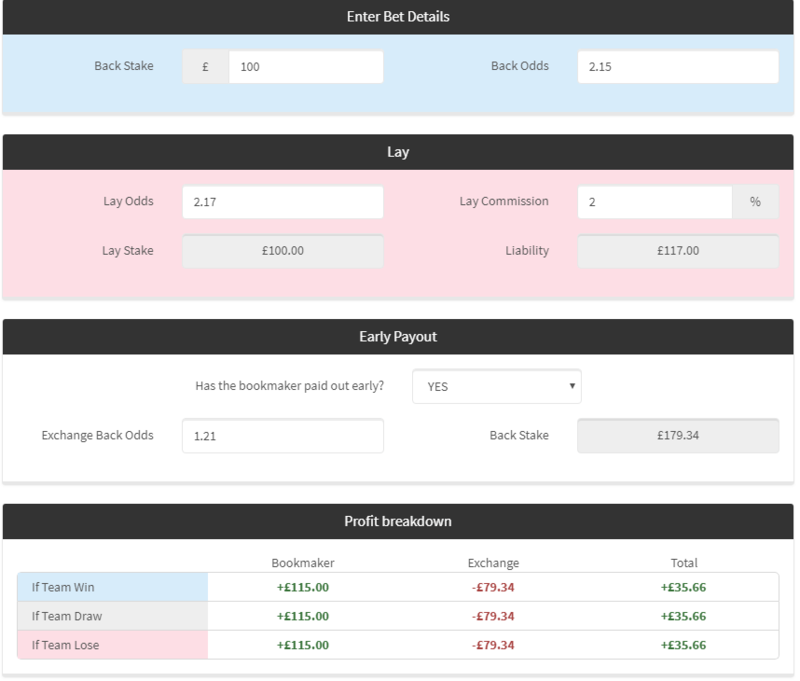 The first is to simply use the 'cash out' or 'trade out' feature on the betting exchange if they have one and the second is to use an 'early payout calculator from a matched betting site such as OddsMonkey. This will display your overall profit which should help you determine whether you want to cash out or wait to see if the other team comes back so that you can return a greater profit. Now that our team has gone 14 points ahead, the odds on them winning have shortened to 1.21. Using the OddsMonkey's Early Payout calculator as shown above, we are now able to lock in an overall profit of £35.66 by placing a £179.34 bet on the Green Bay Packers to win. As we have already placed a lay bet on them, we won't need any additional funds in our exchange account. Just like Paddy Power's 2 up offer on football, 14 up can be extremely profitable. The most important thing to take into consideration is the importance of minimal qualifying losses. Your team will not go 14 points ahead every time and if they do, the cash out value may not be much, which means you may opt to wait to see if the other team comes back, which again, may not be very likely. By keeping qualifying losses to a minimum, it means that you can bet on more games which will significantly increase your chances of being in profit from the offer more often.